Warning: This post may will contain excessive levels of cynicism, complaining, and irrational thought. While I wore my fair share of friendship bracelets, and tight-rolled my jeans with flair, I am generally able to resist peer pressure. In fact, when I feel pressured to do something, but haven’t had time to decide for myself that it’s something I want to do . . . I might just dig in my heels and refuse to do it. Anyway, I had stumbled upon, and then Diane had also mentioned in a comment recently, that the organization blog A Bowl Full of Lemons was doing an organizational challenge this month. I checked it out while holding my breath. I’ve mentioned before that organized people scare me a little, and I rarely visit organizational blogs because I get so quickly overwhelmed. I’m doing things at my own pace here, and I’m making progress. Real life progress for a real life slob. Not whip-it-back-into-shape organization by someone who gets giggly at the thought of baskets. But honestly, she seems really nice, and quite encouraging. So, I thought I’d check out the daily challenges and see if I could fit one in. You know, because if I’m not going to blog about it, I’m probably not going to do it. My motivations are oh-so-noble and all. I glanced at the clean-off-your-desk challenge. I smirked at the before picture looking like my dream after-picture. But then, I visited the Tupperware cabinet and linen closet challenges. And my cold heart softened a little. Her before pictures were . . . . actually messy. And this is someone who loves organization! I started to think maybe we could be real-life friends after all. It gives me hope to know that an organi-lover might just have a messy linen closet. Maybe they took down their Christmas tree before yesterday, and maybe they didn’t just this morning pick up the tissue paper from their 9yo’s birthday party (on December 28th of LAST YEAR) . . . but just knowing that their Tupperware isn’t perfectly organized . . . helped. So, I decided that today would be the day. The day when I would join in. After lunch, I turned on the computer, checked the assignment, and fell immediately into a funk. Really? 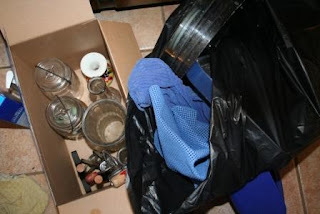 I could have done the Tupperware or the linen closet (not that I did)!!! But really? 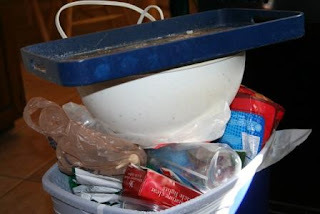 Under the kitchen sink? I mean, I avoid even thinking about what’s under there. And I’m having a good hair day for the first time in weeks, and this project means getting on the ground and sticking my head way back into the recesses of my how-neat-that-the-sink-is-in-the-corner cabinet!!! I opened the cabinet door, and stared for at least 3 minutes. I finally pulled out a few of the things in the front, and then stared for a while longer. I tried to convince myself that this was an impossible task, that everything under there probably needed to stay anyway. But finally, I grumpily got a footstool and sat down. I pulled out the miniature Beethoven statuette. 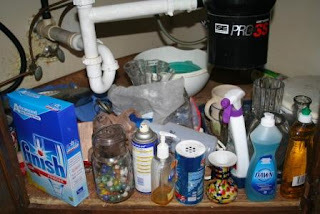 Because that’s what every sane woman finds under her kitchen sink. I think I put him under there when I needed to put out Christmas decorations . . . three years ago. He’d been there a while at least, because his face had been eaten off. Not by rats, but by lying face down, never getting moved during the time when our sink was leaking. I also found various vases and other decor that I never replaced after I accidentally decluttered my kitchen window in the fall. It’s a rare thing that I put out flowers, so I think the three I kept are plenty for this wanna-be minimalist. The sentimental items were most difficult. These are two milk bottles I got when I was in college and visited Hong Kong. I put them to use by placing paintbrushes in them up on the counter where I could actually enjoy them. And I just flat-out threw away a lot. 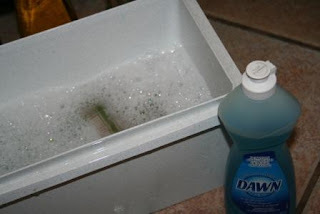 While that tray and bowl might be usable after being soaked and deep-cleaned, I haven’t missed them for several years. They can go. I was oh-so-tempted to stop after the decluttering. Surely that was enough??? 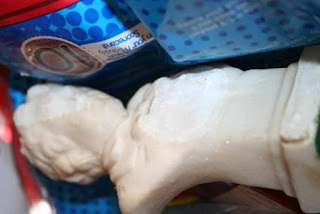 But I muttered and scowled as I searched in the garage for something to put some soapy water in. Something that would never have food in it and had never been used to clean a bathroom. Since I am, after all, a germaphobe. I scrubbed, even crawling almost entirely into the cabinet, and shined up that curly-80s-faux-wood-grain-linoleum. After all of the griping and whining and complaining of my inner-monologue, I’m glad I did it. It looks good! 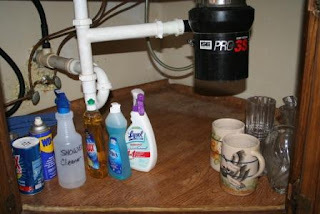 I think under your sink must be bigger than under my sink. I have been following the challenge, from day 1.. and I have been thinking that I should give it a try…. and you know what, after reading your post(with a smile on my face, may I just add) I think I'm going to sign up. GREAT JOB! From one slob trying to be clean to another, WAY TO GO! Glad you joined the challenge. I have slowly been transformed and I even bought a label maker today! What is the world coming to?! Enjoy your cabinet! The sink area looks terrific! I'm doing the challenge too and have (so far) really been enjoying it. I've been following your site for at least a year now and really enjoy your candor and honesty! I love your voice! This post made me giggle. 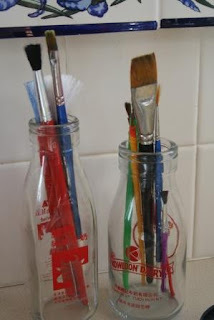 I also love the milk bottles and kinda now want some of my own–not that I have a place to put them. Great job cleaning it all out. You are too funny! Wow, you got that cabinet clean. Thanks for joining my challenge. I cant wait to see what you do next! I am also super envious of the milk bottles. Having grown up on a dairy I think that they are just the cutest. It looks awesome way to go !!!!!!!! I am also part of the challenge but my stupid computer is acting up so I cant post pics. Great job! I'm totally with you on being intimidated/irritated by the organization blogs. This is the first challenge I've joined for just that reason. I've been pleasantly surprised that I've been able to somewhat keep up (although my Christmas tree is still up and the house hasn't been cleaned in…uh…never mind). That's a great use for the milk bottles and you're absolutely right about the bowl. There is no explaining how the Beethoven migrated through the wall of the cabinet and settled in for a good long hiding. You got started and you didn't let that other inner voice that says "later" or "another time" take over. Great job! The challenges sound interesting. I would have totally tossed rather than scrubbed and soaked, good call. I haven’t finished the post yet but I think I love you. That cabinet looks amazing by the way! And reading this makes me feel pretty motivated. Hey I just took the paper hearts I cut out off of our door that I put there for Valentine’s Day and it’s the end of July! About time! Wow! I am readin your blog from the beginning after discovering your podcast and blog. I have to say the Beethoven made me laugh out loud. I really love reading your journey and am glad I can follow along from the beginning! So glad you found me!! Welcome!! I have been reading your blog for the past few months, bought and read your books AND watched your podcasts. I have to tell you, you are the first person that truly motivated me to “deslobify” (is that a word?) my house…because I feel like you get me and the way my brain works (or doesn’t work depending on the day). Although I won’t post before and after pictures, since the before is WAY too embarrassing, but I’ve already noticed a big difference in just the few things I have done. I want to thank you for all your great advice! I love hearing this, Kathy! Thank you! Several snort-out-loud moments in this post and the comments: Beethoven under the sink, I haven’t finished reading but I think I love you, clutter is evil and it WANTS to stay in your house. I’m still chuckling at all those.